Theresa May has secured concessions from Brussels that will allow her to keep all of Britain in a customs union with the European Union and avoid a hard border in Northern Ireland, the Times reported, without citing sources. Too many mixed messages leaking out. A temporary only arrangement with no backstop. We need to remember that Henry VIII's solution with regard to quitting the Catholic world was to default on Britain's massive debt to the Borgias/Italian banks, and to steal all the property of of the Catholic Church in the UK. It worked out well enough for them, back in the day, when they were becoming the world dominant naval power. Seems to be agreed that the Backstop will be that the UK stays in the Customs union permanently. If you can leave but stay in the Customs union why shouldn't other countries leave too? "Agreements already reached between the EU and UK say it will remain “unless and until” another solution to avoid a hard border is found, either by way of a future trade deal or by technological solutions. The UK formally leaves the EU next March and will enter a transition phase which will see it stay in the single market and customs union until the end of 2020. If a future trade deal has not been concluded at that stage, the backstop will then kick in. It is understood the UK has been pushing for a set time when the backstop will cease to apply but Dublin and Brussels are firm that “unless and until” must remain. Periodic assessments of the talks on the EU-UK future trade deal may be made, and the UK may also have the chance to extend the transition period before it ends in 2020. It is now accepted that regulatory checks on goods travelling from Britain to Northern Ireland can be done at factories and shops rather than at Border crossings, a development of Mr Barnier’s “de-dramatisation” initiative." I won't say (yet) I told ye so, but this is the classic EU fudge, can kicking par excellance. The second last para is the kicker, keep kicking the can until...? I wonder what implications Brexit will have on Julian Assange and his sanctuary at the Ecuadorian Embassy in London? Last edited by Trow; 05-11-2018 at 03:26 PM. Quote.. "Brexit threatens to deepen the rights crisis and there is a real danger of serious erosion of current guarantees." The letter raises concerns about Brexit's impact on cross-border healthcare and education, as well a lack of representation for Northern Ireland in the European Parliament. Belfast lawyer Niall Murphy, who has been involved in compiling the letter and its predecessor, told The Irish News that almost every section of nationalist civic life was represented among the signatories. "That this letter is signed by over a thousand leaders from the nationalist community is a testament to an evolving earthquake in terms of an awakening of nationalist confidence," he said. Britain is now pushing for a North Sea border, with 'Great Britain' on one side and the EU on the other. More or less what I predicted from day one of this. The UK in negotiations now is bringing it on, and the EU I must say not looking too steady. Ireland the little child trying to keep it together while Mammy and Daddy slug it out. Looks like we’re heading for no deal. Such an outcome will have serious consequences for economy of Irish Republic. In addition, UK won’t have to pay a penny more to EU, which means big increase for Dublin. Can’t understand why Irish Government seems so intent on this course. Come on Cass, in the words of John McEnroe, you cannot be serious. 2. What do you mean bu "more or less" I don't recall any of the suggestions on here on how brexit will pan out, that we (the RoI) would leave at the same time. Given, as I have said and you have commented on, we were unprepared, and still are, the kicker is we got a written agreement from the brits (amazingly) getting us off the main hook that brexit would/could get us on, namely that Larry Goodman would move his set of EU scams across to NI and who would we sell the cattle to? 3. Coveney is flogging away at the embarassment that the UK would suffer if they renege on the back stop. Embarrasment has never stopped the UK from reneging in the past. 4. How would the EU implement a brexit including us, if we didn't activate article 50? "The latest fear among Opposition TDs is that the Government might unwittingly backtrack on the Brexit backstop and find itself backed into a corner by European Union and UK backstabbers who will sneak a hard border back into Ireland through the back door and then when the smoke clears there is no way back." Not that we would, but that the economic and political pressures to do so would become very significant. And hasn't Varadkar confirmed that the British have quietly assumed from the outset that ireland will in due course leave the EU ? Meanwhile, the Yanks (at least some of them) would prefer a United Ireland. The prime minister’s Cabinet has been invited into a reading room to study what’s been agreed so far. The crucial bit is still missing — how to avoid a hard Irish border without binding the U.K. into European Union customs rules forever. That’s still being negotiated in Brussels, where EU officials are sounding a bit less optimistic than their U.K. counterparts. Officials on both sides are figuring out what the choreography might look like. Success would probably see Brexit Secretary Dominic Raab — or May herself — visit Brussels to seal the agreement with a handshake. Then a summit of EU leaders would be called. Ian Wishart reports from Brussels that the EU is anxious not to allow too much time to elapse before this meeting. There’s no date yet, but Nov. 18, long penciled into EU diaries, looks like it’s still in play. EU ambassadors are meeting on Friday, a gathering they postponed from yesterday in the hope of having more to talk about. While the Cabinet is expecting to be recalled within days, two people familiar with the U.K. side told Bloomberg’s Tim Ross that she would not need to wait for ministers’ approval before signing up in principle to the terms negotiated in Brussels. May goes to Brussels tonight for a NATO dinner. Then on Friday she attends World War One commemorations in Belgium and France, and will have a one-on-one with French President Emmanuel Macron — a key player in the Brexit process. But the fight on the U.K. side isn’t over. May’s proposed solution for the Irish border problem risks trapping the U.K. inside the EU’s customs union forever. Many businesses would be quite happy with this, but pro-Brexit politicians see it as a betrayal of the referendum result. Pro-Brexit ministers led by Environment Secretary Michael Gove are demanding to see the full legal advice on which May’s plans are based, and there’s now a fight over whether that advice should also be presented to Parliament. The Labour Party — which has a track record of forcing the government to publish papers it wanted to keep private — has joined the debate. And Parliament remains the main hurdle, whatever May finally brings back from Brussels. Arch Brexiteer Jacob Rees-Mogg vowed last night to vote down the deal if it includes an extension to the customs union, as is looking likely (though he gave himself some wiggle room). As the prime minister closes in on a deal, a new chapter of the saga comes into view, with the Parliament taking center stage. 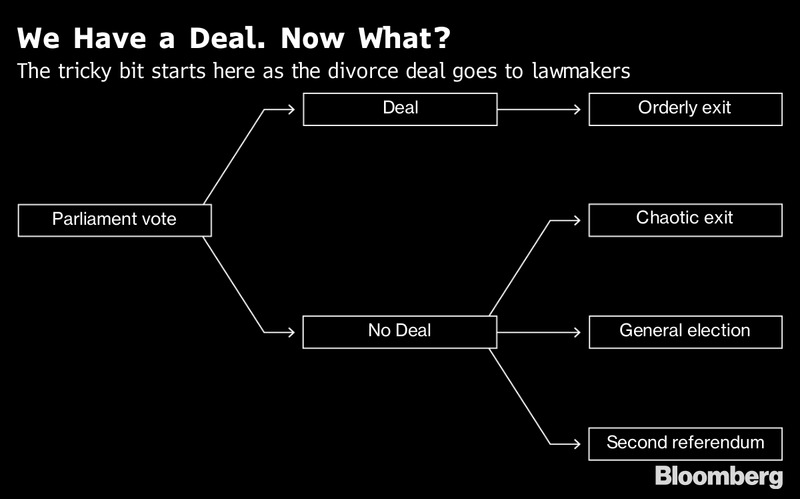 So we made a flow chart to help us all think about the next few weeks, when — if — she gets her deal. “Volatility causes opportunity.” How billionaire American families are seeking to profit from Brexit chaos. May’s progress isn’t enough to stem the exodus of businesses from London. The Guardian has its say on May’s Brexit endgame: “More bluff than breakthrough,” it writes in an editorial. Good piece from politics UK here. Are they idiots or liars? Answer liars. A Brussels plan to put a customs border in the Irish Sea if there is no Brexit agreement will be included in a divorce deal, a leaked letter from Theresa May suggests. The prime minister was accused last night of breaking her promise to the Democratic Unionist Party that she would never sign up to a deal that could allow Northern Ireland to be divided from the rest of the United Kingdom.